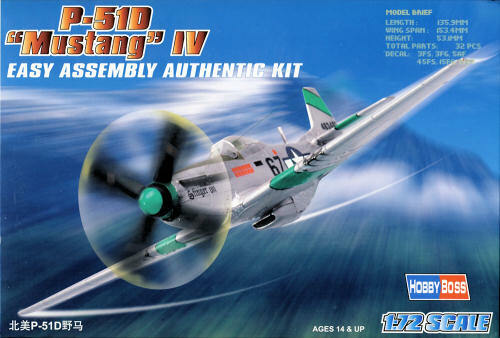 The P-51D needs little introduction, it is often recognized as the greatest fighter of World War II. The Mustang was designed and produced in record time, at the request of Britain. Once the final P-51 rolled off the production line, more than 15,000 had been built. The airframe evolved to a world class fighter aircraft. The Mustang premiered in the skies over Europe serving as a fighter aircraft, but its inherent speed offered an excellent tactical photo reconnaissance platform. The Mustang also served as dive bomber. The conclusion of World War II did not see the cessation of Mustang operations. The P-51 served in the Korean conflict as a ground attack aircraft. In foreign service, the Mustang served in the fledgling Israeli Air Force. The Mustang also continued combat operations well into the jet age, coming headlong against F4U Corsairs during the Soccer War in 1969. Upon opening the box, the low parts count is immediately evident. Nicely secured and presented in a plastic case are 22 well cast parts. All parts are crisply molded and offer fine recessed panel lines. 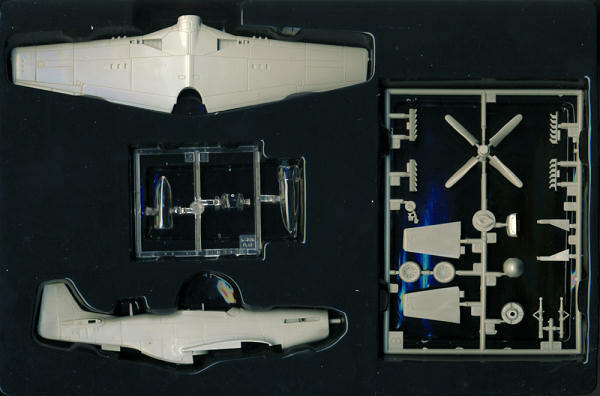 The fuselage is molded as one piece, as are the wings. 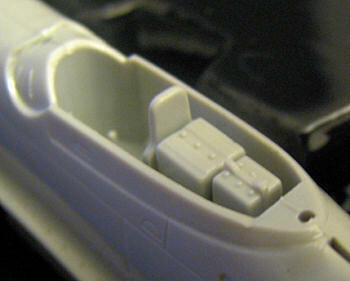 There is a seam line on the fuselage top that can probably be remedied with several swipes of a sanding stick. The antenna on the Mustang痴 spine is oversize for the scale, and has no definition aside from a round pole sticking straight up. This may allow for some rough handling, or something to hold on to when painting without fear of breaking the part. Simplicity of mold also robs the interior of any detail. The radios and seat seam well enough, but there is no sidewall or instrument panel renderings. There is a tiny control stick protruding from the floor though. The underside has a couple areas requiring minor attention, in particular the radiator housing where it is apparent that this started as separate pieces. Hobby Boss inserted this part for the modeler. The leading edges of the one-part wings may require some sanding to round them down a bit, they are very sharp straight from the box. There is minor flash on several parts , but nothing that will present a challenge to the builder. The attachment points on the single tree of parts are small, and should allow for an easy separation. The clear sprue appears thin and crystal. Given the small parts count, the number of options is limited. Firstly, two styles of exhaust are provided. Secondly, and curiously, both a one-piece and two-piece canopy is offered. The lower canopy frame is molded to the fuselage, in the closed position. Thus, the reasoning behind offering a two-piece canopy is hard to explain. In my opinion, these types of kits are overdue, and Hobby Boss should be commended. 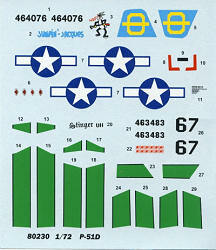 They provide the perfect interim between the pre-painted snap together kits and the high priced, huge parts count kits. This should help plant the seeds of interest in the model-building hobby in younger folks, and beginners. They are molded well enough to offer enough realism not to be toy like, and can be bought up in greater quantities and built quicker than a box of 100+ parts. For the more experienced modeler, it allows a break from getting wrapped up in details, and offers a perfect pallet to experiment with new techniques without buyer痴 remorse. It is a kit that will probably never win a blue ribbon or gold medal at a contest, but would still look great on the display shelf.